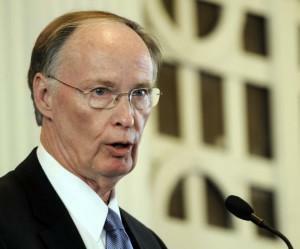 On June 9, Alabama governor Robert Bentley Robert Bentley (Credit: http://blog.latinovations.com/) signed into law what many see as the harshest anti-immigrant bill passed thus far by any U.S. state. H.B. (House Bill) 56, also known as the “Beason-Hammon Alabama Taxpayer and Citizen Protection Act,” exceeds Arizona’s infamous S.B. 1070 in its ambition. Failing federal intervention to block it, the bulk of the law is scheduled to go into effect on September 1. H.B. 56 requires law enforcement officers in the state to inquire about the citizenship status of all individuals stopped for legal violations if they have a “reasonable suspicion” they are in the United States “illegally.” It also compels school officials to determine the immigration status of all students. At the same time, it makes it a criminal offense for anyone to rent housing to an unauthorized migrant or to transport an “alien” if the person “knows or recklessly disregards the fact that the alien has come to, has entered, or remains in the United States in violation of federal law.” Moreover, it enjoins all employers in the state to use the federal government’s “E-verify” program to confirm the legal status of their workers. Just a few days prior to Bentley’s signing of the bill, the Associated Press published its analysis of just-released data from the U.S. Sentencing Commission. 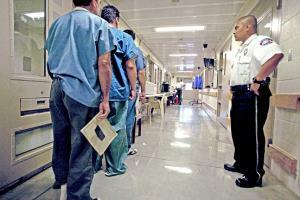 (Credit: Wall Street Journal/Getty) It shows that the presence of Latinos in the convicted felon population in U.S. federal prisons has mushroomed over the last decade—in large part due to convictions for transgressions of immigration law. According to the AP, Latinos, about 16 percent of the total U.S. population, now make up almost half of all persons sentenced for federal felony convictions. Sentences for felony immigration offenses, says the AP, explain 87 percent of the increase in the number of Latinos sent to federal prison for the last ten years. Developments such as the dramatic growth in Latino incarceration brought about by the federal government’s intensifying “war” against unauthorized migrants receive relatively little attention —whether from the media or immigrant and border rights advocates—in comparison to the likes of Alabama’s new draconian law. But just as it was an error in the 1960s to analytically ghettoize U.S. institutionalized racism in the South, and effectively separate it from the larger national socio-political fabric which gave rise to, and sustained, it, it is deeply mistaken (and politically dangerous) to see Arizona- and Alabama-like initiatives as largely local phenomena. H.B. 56 and its forerunners and sure-to-come imitators emerge from a fertile national soil; they are symptoms of a nation-state disease of immigrant regulation and exclusion. First and foremost, this is what needs to be criticized—and combated.